After mocking up our replacement body parts for our project Lotus Elan, it was time to start making the cuts that would allow us to graft in the new bodywork. Once you cut, you can’t go back. With this fact in mind, we took measurements all over the areas that we would be repairing. We did this before we did any cutting and panel replacement. Photographing your measurements makes for great reference points, should you need to see how parts fit together later one. 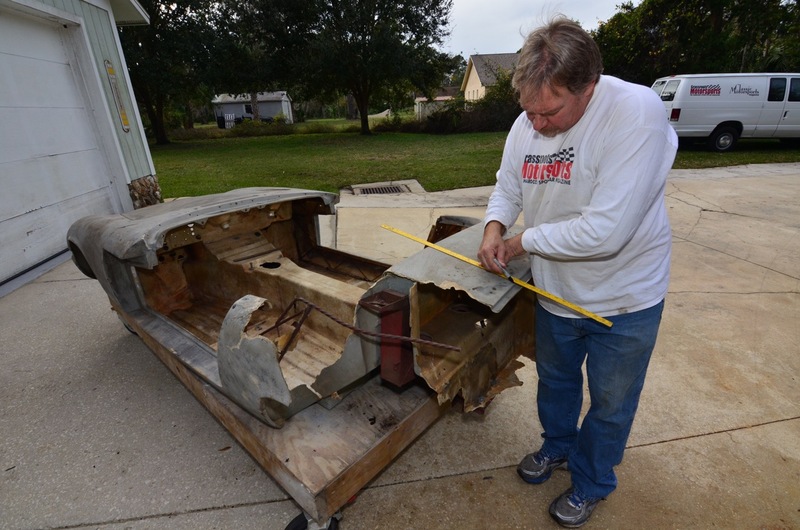 Developing a true centerline through the entire middle of the car is a crucial starting point to replacing quarter panels. 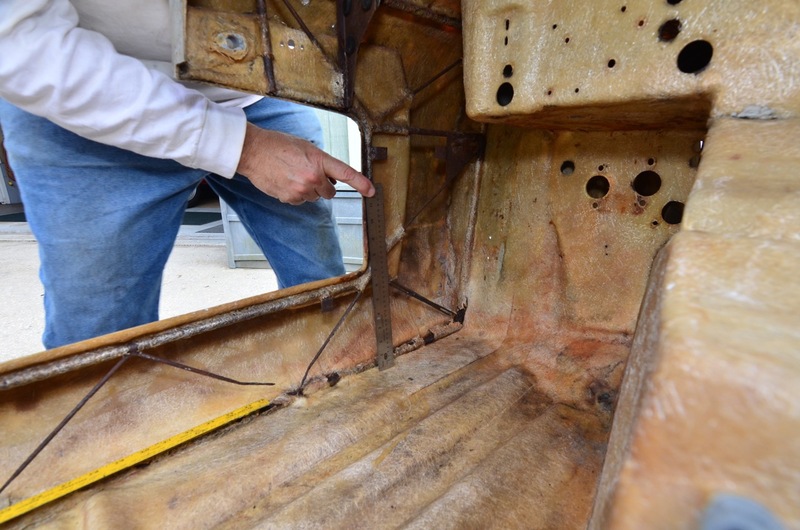 In the first image, you can see just how badly damaged this late Series 1 Lotus Elan really is. We then continue the centerline down through the Elan’s transmission tunnel. The second line will be used to feather material when we overlap the new panel over the original body. 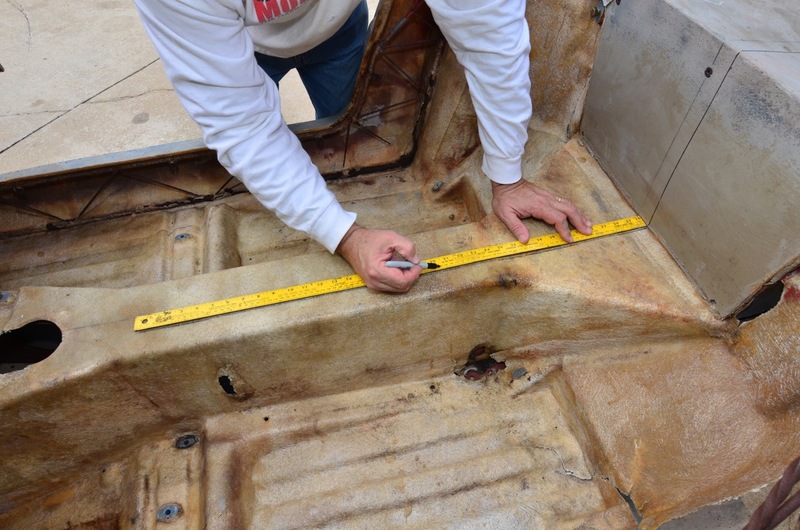 In the third photo, we have a yard stick photographed so you can see where the wire mesh is situated in the rocker panel. Since this mesh is rusted, we will need to replace it. We want to make sure our replacement is in the exact correct location when we do. We also used a shorter ruler to measure the mesh in the A-pillar. Ah... that picture of the "wire mesh" was helpful. So it's more like wire bracing. I kept visualizing something more like window screen and thinking, "what the heck is that for?"